Last week I asked: What Lake Ontario village was destroyed by the British in June 1813? 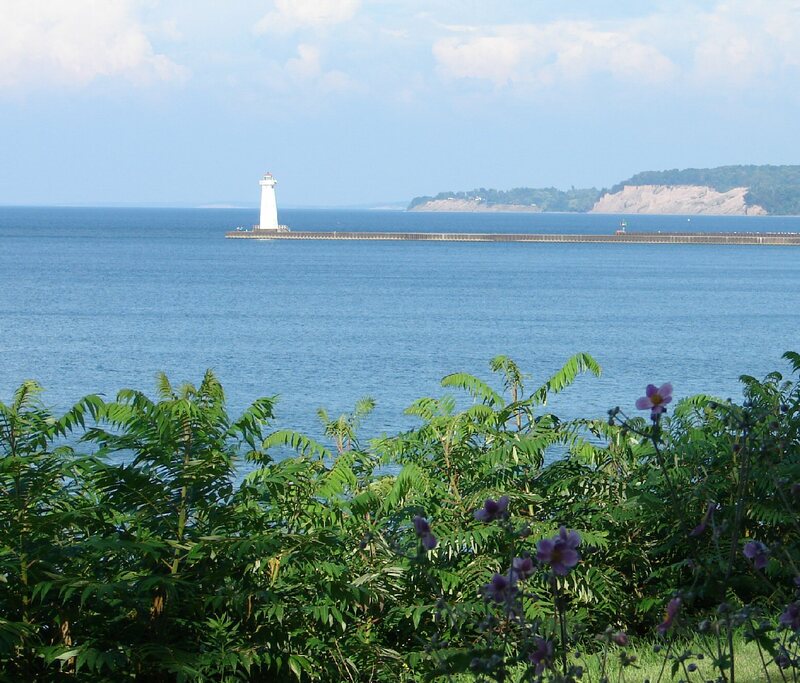 When John and I visited Sodus Point it was a beautiful sunny day. The lake was calm, there were a couple sailboats enjoying the day, and all was peaceful. Things were very different during June 1813. During the War of 1812, the frontier villages along the lake’s shore were aware of the danger with the British fleet never too far away. 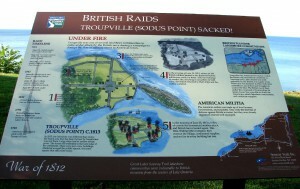 Some government stores were kept at Sodus Point and it was the policy of the British officers to commandeer the stores if they found the place undefended, by force if necessary. The British soldiers attacked confiscating the stores and private property, then set fire to the houses. 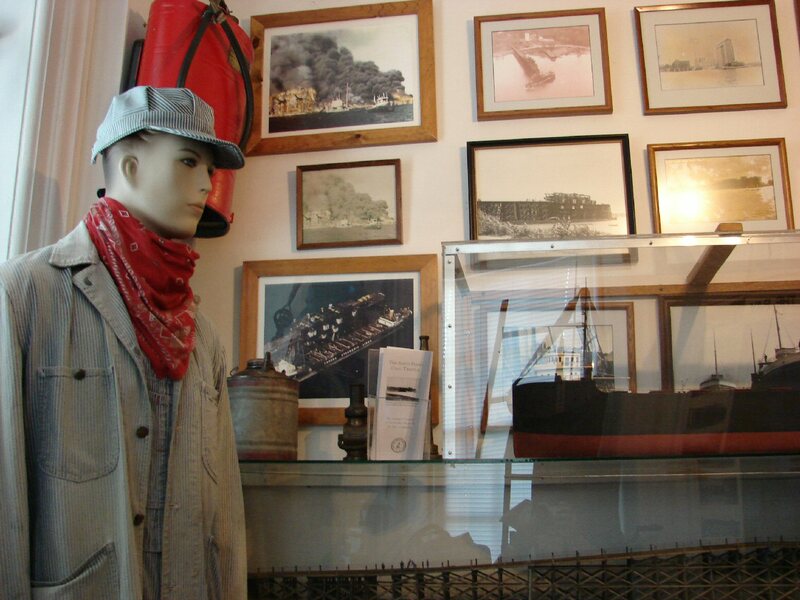 The Old Lighthouse Museum is one place to learn about the battle and the history of the area. 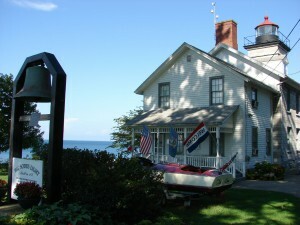 A light station was in continuous service at this site from 1825 to 1901 when the Sodus Bay Outer Pier Light became the main navigational aid for Sodus Bay. The footprint of the 1825 lighthouse is just behind the lighthouse museum. The light was provided by eight whale-oil lanterns with brass reflectors which needed frequent attending. In the 1800s, the shoreline was different than what it is today. 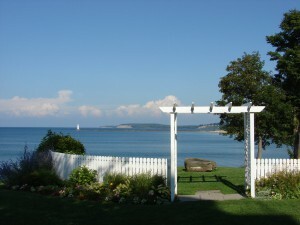 The shoreline to the east of the Lighthouse Museum to the pier gradually filled in with sand and today there are several buildings in what was once Sodus Bay. In 1870 a new lighthouse built to the west off the 1825 one and included the light keeper’s house which now is the museum. Each of the rooms explores a different aspect of the area’s history including the 1813 attack. 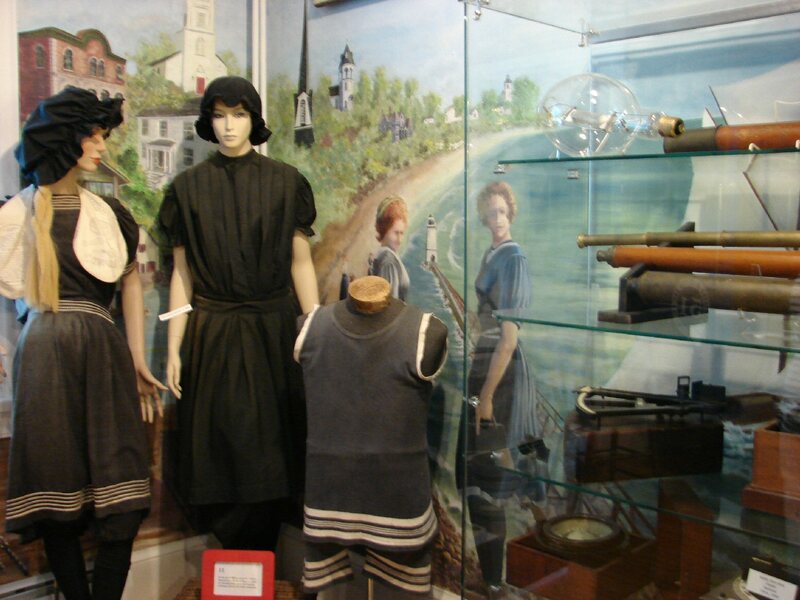 On display are examples of maritime equipment including a gimbaled lamp which would hold candles and lanterns upright in foul weather. 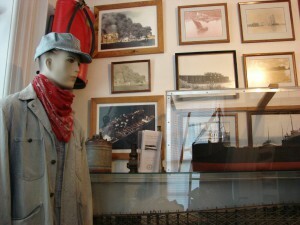 The Erie Canal was so successful when it opened that many areas wanted to get in on the boom including Sodus. A route from Clyde to Sodus Bay was surveyed then dredged but the 200-foot difference in elevation between the canal and the lake would have necessitated numerous locks. So, the plan was abandoned in 1865. The canal boom ended with the advent of railroads which provided year-round service and were faster. Sodus Bay has long been a vacation spot. 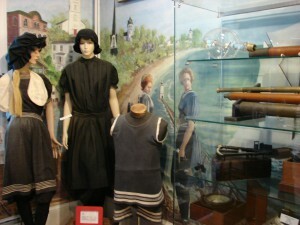 On display are 1880s bathing suits. Beach guards monitored the beach making sure appropriate attire was maintained. If a woman was wearing makeup or not wearing the prescribed attire including stockings while swimming they could be banned from the beach, fined or even sent to jail. It must have been extremely difficult for women to swim in such cumbersome suits. My, oh, my, how fashion and mores have changed. At one time, there were many industries around the bay including a grain elevator, railroad roundhouse, ice houses and a malt house. Each winter, before refrigeration was developed, ice was taken from the lake and stored for use the rest of the year. A typical home used about 300 cakes of ice during the summer. From 1873 to 1969 there was a large coal trestle used to offload Pennsylvania coal from trains into ships bound for Oswego and other Lake Ontario cities. Local residents could hear the dull roar day and night when the coal was being loaded. In 1971 the trestle caught fire while being dismantled. 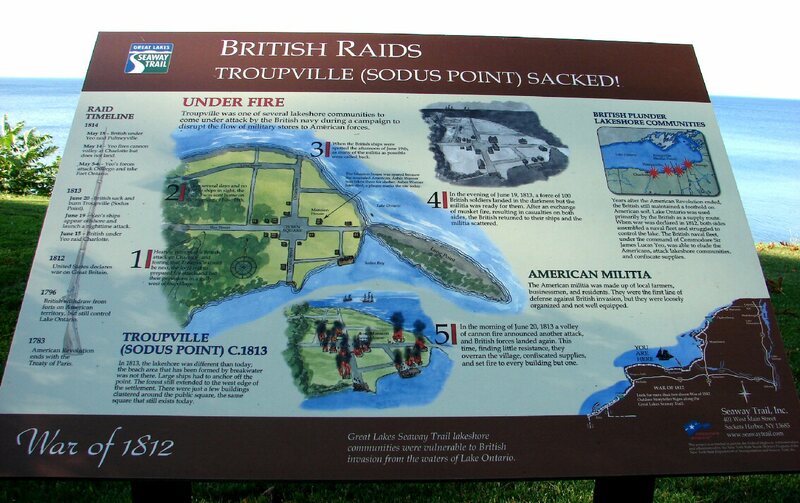 There is a signboard detailing the construction of cobblestone houses and a map of those in the Sodus area. They are open May 1 to October 31. Trivia Tease™: Where are the floating Uros Islands?